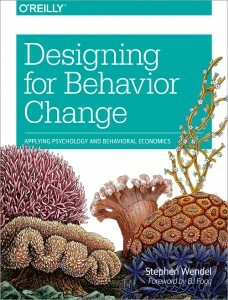 Designing for behavior written by Steve Wendel, is an excellent book guiding developers and entrepreneurs, managers in making behavior changing apps or webapps that really work. The fact that the book takes a, practical approach based on academic literature and personal experiences of the author makes it valuable. Many of the experiences comes from his dayjob, Working as a Pricipal Scientist at HelloWallet, nevertheless most of the examples in the book are taken form a daily live perspective. The book gave me a clear insight and made me conscious about my and others brain and its decision process. And of course which steps should be taken to build an “habit” changing app. And more importantly how the app should tested, refined and reevaluated. Reaction: The mind reacts is the thought appealing enough to do something with it or does the user dislike the thought. Time pressure. The user must have the time, or be pressurized enough to drop the current tasks or occupation. This flow returns throughout the book and makes it sure that you never forget that there is a long process/ action sequence necessary before the user, will download your app. And if the app is downloaded, the sames CREATE sequence is necessary for the user to use your app to change behavior every time. One minor issue with the book is the localized content, for example using America’s pension/retirement fund 401k to illustrate principles. This makes it harder to understand for non americans.